Using the -g option add node-red command to your path. See the documentation.for more details. Note: you may need to change into the node directory. if you installed node-red using the -g option. Firstly running node by typing node may not work as apparently node is a shortcut to nodejs and the shortcut may not be present. Now that node is working you can run node-red.
. If that doesn’t work it’s probably because the link isn’t configured as shown above. You can try the alternative. At the top of the screen you can see the version of node and node-red that you are using and the location of the flows..
At the bottom of the screen it tells you the url to use to access the node-red web interface which you use to create your flows. This console stays open and you will find it useful as when you start creating flows you will see log information appearing there. which starts node-red as daemon. When running on startup you can stop it using the node-red-stop command and restart using node-red-start command. If you want to load node-red on startup with a different settings file than the settings.js you will need to edit the file /lib/systemd/system/nodered.service. When node-red starts it first loads the settings file settings.js which is used to set the admin port, user directory, and flows file etc. The start process is illustrated below. Node red uses a settings file called settings.js. On Linux it is located in the /usr/lib/node-modules/node-red/ folder by default. on Windows it is located in c:\node-install-directory\node-modules\node-red\ . You can create your own settings file and customise it either by copying the existing file or using the file available from Github here. To use your own settings file use the -s switch when starting node-red e.g. Important -If you place a settings.js in the .node-red folder then that will be used by default. The documentation here takes your through the settings file in detail. 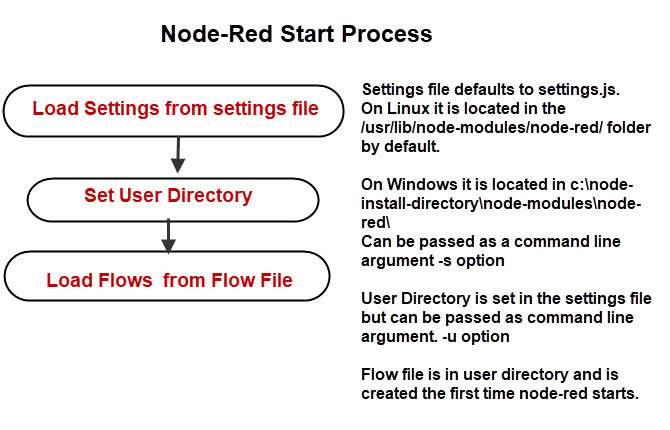 On both Windows and Linux user settings and flows are stored in the .node-red folder. This folder is located in the users home folder. The -v switch turns on verbose mode. The -p switch will let you change the port that node-red admin interface uses. You can use this option to quickly and easily run multiple instances of node-red. It is possible to run multiple node-red instances on a single machine. To do that you will need to give each instance a different admin port and also a different user directory or alternatively create and use a new settings file. the admin port is 1881 and the use directory is user1 the flow file name uses the default flow name. Note: If you don’t use a different user directory then they will all use the same flows file which could result in conflicts. If you create a new settings file e,g mysettings.js you can then edit the line starting with flows and remove the two forward slashes. to use a different port. ========>How to use the Admin Interface, nodes and flow basics. I found another page can start it with pm2 https://www.rs-online.com/designspark/installing-node-red-on-a-synology-nas but it isn’t working too. 🙁 After install pm2 the console show me the same message pm2: command not found. How can I run in the background the node-red? Please help!